The depth of history at Queen Anne's Gate - a handsome Baroque street overlooking St James's Park - is unusual even in London, and few houses resonate with more memories than the extraordinary number 14. The story of the house over the centuries features political revolutionaries, occult initiations, clandestine war meetings, and a decapitated head. It begins, however, as a museum of Roman sculpture, unrivalled outside Italy, designed for connoisseur and virtuoso Charles Townley (1737-1805). Townley embodied Enlightenment values perhaps more completely than any other figure in the art world of 18th-century Britain - his portrait by Johann Zoff any (seen above) is one of the iconic paintings of the period - yet remarkably he has never been the subject of a major publication. 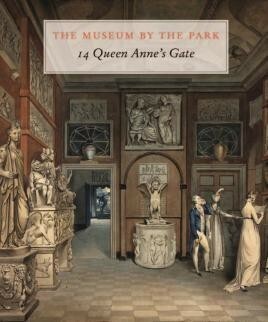 Written with a sparkle matching Townley's own enthusiasm, this beautiful and engaging publication tells the story of 14 Queen Anne's Gate and examines the extraordinary life of Charles Townley and his remarkable collection of over 150 Roman marble statues (mostly now in the British Museum but captured in spectacular engravings of the period). It will be a revelation. The house was designed as a temple to the past, reviving in the modern city the occult practices of the ancient world. Here visitors in eighteenth century would have found an assembly of Roman sculpture unrivalled outside Italy, as well as a library and collection devoted to understanding a universal ‘generative sprit' worshipped by early civilizations. That spirit may be found in the succession of major roles the house has continued to take through generations of dramatic change up to the present day. Charles Townley, for whom the house was built, was a fi gure both marginal and emblematic. Catholic and bisexual, he forged a life literally on the borders of the Protestant British establishment. He remains little understood or appreciated in his homeland and, remarkably, has never been the subject of a major exhibition or publication. The ‘emblematic' side of Townley's life was dedicated to virtù, the term used for an appreciation of fi ne art pursued for its own sake. The ‘marginal' side of Townley, by contrast, manifested itself in a fascination with the ancient occult, particularly the Bacchic mysteries. The house he made for himself was at once a temple to virtù and to Bacchus and contained an unprecedented programme of Bacchic iconography.